Today, we take a quick look at the WordPress customizer; the interface where you will add much of the information in regards to your website name and design features. The WordPress customizer is an intuitive and easy way to manage features such as company logos and custom CSS. The WordPress customizer is a relatively new feature to WordPress. In the past, custom functionality had to be built to manage features such as adding a company logo or changing your website colors. Well, that is a thing of the past. In this video, we walk you through how our themes implement the WordPress customizer and what customizations are available to you. We will show you how to add your company logo, change your theme colors, display content modules on your homepage such as Testimonials,Community pages, and recent blog entries. 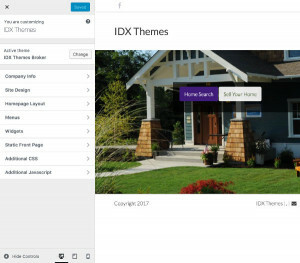 In each subsequent video, we will walk you through the creation in each of the modules available to you in the IDX Themes framework. We will start with adding Slider Images and move on from there. Enjoy!